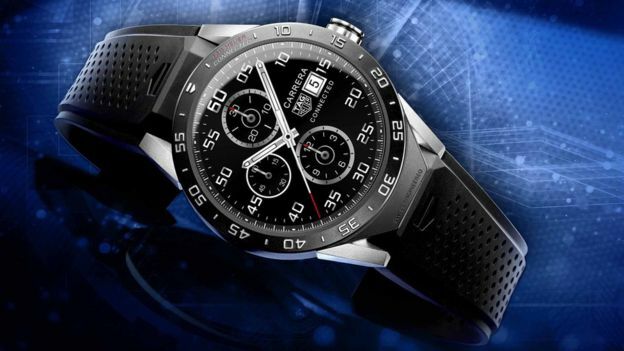 Tag Heuer: Smart watch, smart move? Luxury watch maker Tag Heuer has unveiled its first ‘smart watch’, an Android Wear device based on its Carrera series that sells for $1,500. It makes Apple’s highest-priced watch look pretty overpriced at $10,000. Let’s face it, most luxury watch buyers would probably rather have a Tag-branded device on their wrists than an Apple one. But just how smart is Tag’s move into smart watches? It seems the company isn’t too sure itself as it’s giving customers the option to ‘upgrade’ (at a $1,500 fee) to a mechanical Carrera watch after two years. I’m not so sure of that myself. Just a few years ago it may have been true, but Android has been outselling Apple’s iOS for some time. And even though Apple has won over Android fan with its bigger iPhone 6’s, Android is still the most used system with higher loyalty rates and new users more likely to choose it. Anyway, Tag had to go with Android because Apple doesn’t license iOS for other manufacturers. So just how is the brand pitching its new luxury timepiece? Well, not as Swiss-made as most of its components (like its Intel processor) were made elsewhere. And not at women either – which is a very different strategy to existing smart watches that are meant to be seen as unisex. The Tag timepiece is pretty big and the company says it will only offer a women’s version when it can downsize it. Instead, the company will focus on its 155 year heritage and on its plan B that lets unhappy buyers switch to mechanical watch. If that sounds a bit negative, don’t walk away with the idea that this device isn’t up to scratch. It’s got a full-day battery life, three exclusive watch faces, sports-themed exclusive apps (golf, motor-racing, trail walking – all the things that Tag’s affluent customers should like), plus Android Wear’s regular software offer.